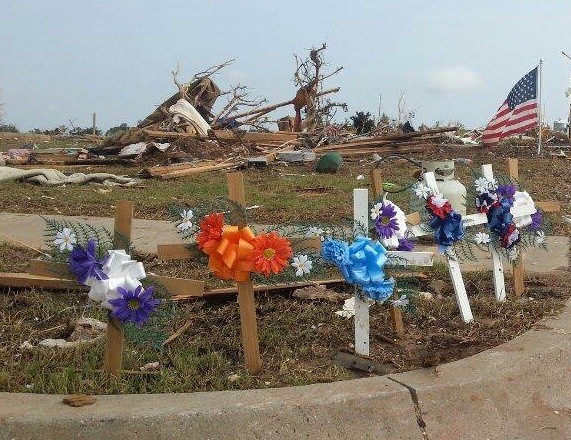 Seven crosses, for seven dead students, have been posted near the wreckage of Plaza Towers Elementary School in Moore. When it comes to making sure that school kids have access to tornado shelters, Oklahoma’s state government has kept its distance. The state does not require public schools to install shelters, does not keep track of which schools have them, has provided limited state tax dollars to build them and has not assessed the cost of installing them statewide. The state’s minimal intervention in school shelter issues reflects a concern over costs and a long tradition of local control. It’s been left up to local school districts to decide where shelters will be located and how to pay for them. Many state officials say they want to keep it that way. But as people across the country ponder the devastation caused by Monday’s EF5 tornado in Moore, including the destruction of Plaza Towers and Briarwood elementary schools, some have begun asking whether more state involvement is needed. Ernst Kiesling, executive director of the National Storm Shelter Association, acknowledged that tight school construction budgets would make it difficult to finance installation of shelters at all schools. But he said it makes sense for Oklahoma and other tornado-prone states to begin requiring them in new school buildings. Safe rooms are concrete-reinforced enclosures designed to withstand tornado-force winds. They can be incorporated into construction of new schools or built adjacent to existing schools. They can double as gymnasiums or multi-purpose rooms. Adequate safe rooms can be built for as little as $200 per square foot, Kiesling said. Standards require at least 5 square feet for every adult occupant. That means a shelter large enough to hold 1,000 peoples would cost in the neighborhood of $1 million. Kiesling said he was confident that if safe rooms had been in place at Plaza Towers and Briarwood, they would still be standing today. Only one state, Alabama, currently requires installation of storm shelters in new school buildings. Alabama enacted its statewide mandate in 2010, two years after tornados destroyed a high school in the city of Enterprise, killing nearly a dozen students. The measure requires the installation of safe room in newly-built schools and schools on which additions are constructed. In April 2011, several tornados swept across Alabama, destroying numerous homes, businesses and schools. While those buildings are being reconstructed, many of the students are being taught in temporary schools equipped with safe rooms, said Alabama Emergency Management Director Art Faulkner. “We wanted to make sure our kids are safe, even when the kids are in the temporary schools,” Faulkner said. Safe rooms in reconstructed schools are being paid for by the Federal Emergency Management Agency. Other schools not affected by the tornados must use their building funds to pay for safe rooms, Faulkner said. In the absence of state mandates, some cities, towns and school districts have taken action on their own to place shelters in schools. In Wichita, Kan., local voters approved a school construction bond issue in 2008 after officials promised they would use some of the funds to install tornado shelters, according to Wichita Public Schools spokeswoman Susan Arensman. Initially, FEMA funds helped with the construction of school safe rooms, Arensman said, but those funds soon dried up. The district decided to cut back on other projects included in the bond issue to finish construction on the safe rooms, she said. Of the nearly 100 schools in the Wichita Public School District, 69 schools now have safe rooms, and more are under construction on in the planning phase, she said. FEMA funds have helped finance installation of school shelters in Oklahoma. Albert Ashwood, director of the Oklahoma Department of Emergency Management, said Thursday that his agency has passed out $57 million in federal funds since the massive tornado that struck Moore in 1999. Those funds contributed to the installation of 11,336 residential safe rooms and 336 community safe rooms, including school shelters, Ashwood said. Still, only about 100 of Oklahoma’s more than 1,800 public schools have installed safe rooms financed with FEMA money, and state officials said they have never compiled a complete list of which schools have shelters and which don’t. Ashwood said his agency intends to begin compiling a comprehensive inventory. So far, state revenues have not been a major source of shelter funding. Most school construction is financed from bond issues repaid by local property tax collections, with FEMA kicking in additional funds earmarked specifically for storm shelters. Some lawmakers think the state should become a bigger partner in the process. A first step in that direction could come from final passage Thursday of a bill authorizing the withdrawal of $45 million from the state’s Rainy Day Fund to help finance tornado relief efforts. The fund has a current balance of $577 million. The measure, approved unanimously by the House and Senate and sent to the governor for her signature, does not specify how the money will be used. But sponsors said a portion could be allocated for school shelters. In a separate effort to generate funds for shelter construction, four lawmakers announced plans Thursday to set up a nonprofit foundation to receive private donations for safe rooms in schools. Although Fallin indicated she wanted to explore the possibility of requiring storm shelters in public schools, some state lawmakers appear reluctant to impose a mandate that would cost many millions of dollars. Earlier this week, Rep. Joe Dorman, R-Rush Springs, proposed emergency legislation to authorize $400 million in state revenue bond financing for school shelter construction and another $100 million for shelters in private homes and group homes. So far, legislative leaders have taken no action on his request. A spokesman for House Speaker T.W. Shannon, R-Lawton, said Thursday that Shannon wanted to study Dorman’s plan and other tornado-related proposals during the break between the 2013 and 2014 legislative sessions. “People here in the Legislature speak with forked tongues,” said Rep. Richard Morrissette, D-Oklahoma City and one of the four House members involved in setting up the private foundation.